Books are powerful things. Writing, as I do most of the time, for other book junkies, I know I'm preaching to the choir - we all know just how much a book can change us, our lives, our outlooks, transport us, transform us, etc. 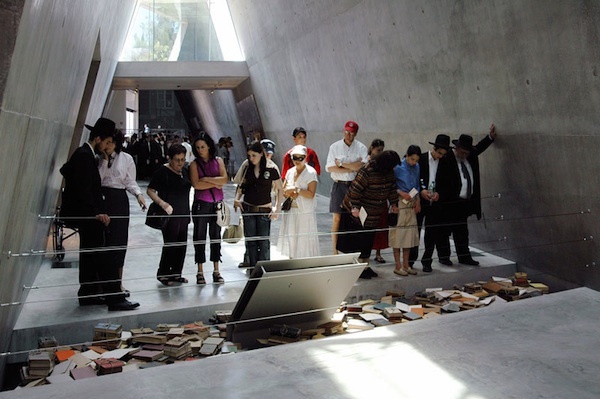 It is prominently displayed at Yad Vashem in Jerusalem, the Holocaust Museum, and I remember standing at the part of the display of books representing those burned in Nazi Germany - one of those seminal moments in my life. The sense of death was strong there, as in other parts of the museum. When we censure writers, we potentially silence the voices of all of us - the writers who speak for those who cannot craft the words they wish to say into written text, those visionaries who see the things we maybe only sense and find the language with which to voice them. This list of books that have, at various times been banned, and the reasons why they have been banned seem, to me, outrageous. Here's the link - have a look, tell me what you think...and this isn't some 'backwards' netherworld. These books have been banned in America - so called bastion of the 'free world'. Well... I read the list, and in America's defense, unlike Nazi Germany, which had an overriding agenda that served a political purpose, the American bannings seem to have been motivated out of sheer aggressive stupidity. In her not-so-much defense, this country is rapidly becoming the very police state I carried a gun to oppose in her name in the 1960s. In line with that, this will probably be my last communique, for as soon as Mr. Obama reads this, they'll be around to collect me. Always, you bring a smile to my face! I meant to include some comments in the post about a hyperactive sense of PC in some of the decisions with some of those books, and clear forgot to do it, but your framing of it as 'sheer aggressive stupidity' does quite nicely too! You reckon Mr Obama is following MY blog...well, if he is, rest assured, I'll have a quiet word with him if I don't hear from you soon, OK? You want to be careful with a term like "PC." Like so many words in the English language, it contains silent letters and odd conventions. It may look like Political Correctness, but it is pronounced "Intellectual Fascism," and is far more insidious than anything the Nazis ever put in place because it misleads decent people into thinking they're doing the right thing by censoring other peoples' thoughts and ideas. Personally, I'm glad you forgot it; in terms of masking evil, it's the intellectual equivalent of The Final Solution. Get the idea I'm a crusader on this issue? Just a little bit, Jack... Something about your metaphors gave you away!